A quick share today with another publication for the Australian Cardmaking, Stamping & Papercraft magazine. This card reminds me that I really need to get out this gorgeous stamp set once again, isn’t she adorable! Other Supplies: Copics – E000,00,50,53. Y11. R20,005. RV10,13. BG10. G40. T0,2. < Previous Best Day Ever! Next > WTF…. at CTS! Sweet! Love this retro look. Those dp are fantastic, and I love those colors! I think I had a trike like that when I was little, only I’d have been in overalls!! Great card. I love your colors, and what a perfect sentiment for that image. That is a wonderful encouragement card. 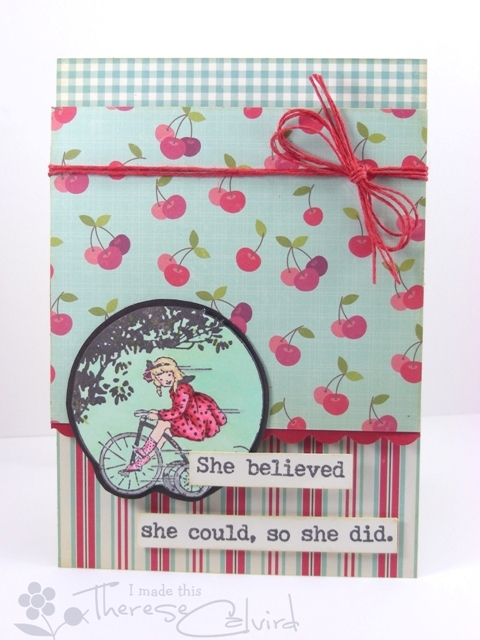 So cute, love the cherries paper. I love this sweet ‘girly’ card, Therese! Love your coloring, the pretty papers and the perfect sentiment! Congrats on your well deserved publication! Very cute. Congrats on your publication. TFS. Totally adorable 🙂 Well done and ANOTHER publication, too!! Love the paper and nice card too! Great mix of colours and papers. Aw, she is super darling. Gorgeous card.